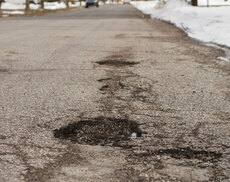 MDOT estimates it costs $20 to fix a pothole. The $50 million Michigan takes from taxpayers and gives to movie makers who visit the state temporarily to film could fix 2.5 million potholes. With the recent release of Gov. Rick Snyder’s fiscal 2015 budget we can examine his administration’s priorities for the coming year. Once again, Michigan’s corporate welfare apparatus — led by the Michigan Economic Development Corp. — looks like it gets a boost instead of a well-deserving and large cut. The MEDC’s basic function is to take money from many people and give it to a few under the guise that it will create more jobs than the taxes needed to fund it will kill. The people of Michigan would be far better off eliminating the MEDC outright rather than goosing up its appropriations and responsibilities. The MEDC’s many failures and other short comings are well known. This institution has not only presided over what was arguably the largest decline in Michigan’s economic fortunes, it once twisted in apology for its premier jobs program, the Michigan Economic Growth Authority, or MEGA, which was a proven failure. It once even offered a subsidy deal to a convicted felon out on parole. The MEDC and its many “jobs” programs should be eliminated. Doing so would save as much as $300 million annually in fiscal 2015 that would best be spent elsewhere. State revenues for the MEDC actually are appropriated by the Legislature on behalf of the Michigan Strategic Fund, which is a corporate welfare vehicle from the Gov. James Blanchard era. The majority of the revenues appropriated are transferred to the MEDC, though these are not the only sources of revenue. Unless otherwise noted, the figures in this document are taken from the fiscal 2014 enacted budget, not from dollars recommended by Gov. Snyder for 2015. The line item appropriations from which the state could save money by eliminating the MEDC include high profile programs such as the “Pure Michigan” advertising campaign ($29 million), “business attraction and community revitalization grants,” (which replaced the MEGA program) ($95.2 million), and arts and cultural programs ($7 million). There also is a film office line item worth less than $1 million for administration of the state’s film subsidy program. The program was worth $50 million in fiscal 2014 and is included in my potential savings totals. The MEDC also received revenue from tribal gaming operations that were worth roughly $58.3 million in fiscal 2013 and which could be redirected to other uses. This figure includes “permanent fund” dollars from the Nottawaseppi Huron Band. All of these revenues and more are available to a Legislature willing to redirect them to a higher valued use, such as road repair, or permitting the personal income tax rollback taxpayers were promised in 2007. Eliminating the MEDC could result in 2015 savings larger than $300 million, though the final figure will depend on where the 2015 budget ends up. The governor’s proposed fiscal 2015 Strategic Fund budget contains $12.5 million more in annual debt service to fund university and community college projects. There also is a $5 million appropriation earmarked to do the marketing of Michigan’s “automotive sector and public-private partner engagement and collaborations within the auto industry, such as pilot projects in supply chain management.” The governor is also boosting the Pure Michigan program by $2 million. On the other hand, Gov. Snyder has proposed $25 million in film subsidies, a 50 percent cut over last year. He proposed the same in 2014 but it was doubled by GOP lawmakers. The same could happen again this year, so it is difficult to see how the net savings figure will wash out. None of this is necessary. People and job providers helped create jobs and growth in the Michigan territory and the state long before some politician thought it would be a good idea to confiscate the wealth of many and redistribute it to a few. People will continue to do so even after Michigan’s nanny state for commerce is closed. Corporate welfare programs fail for many reasons. First, taking money from many job providers and investors and giving it to a few just redistributes opportunity. Second, the MEDC’s bloated bureaucracy is expensive to run, which includes paying 52 of its employees more than $100,000 annually. This is money that gets sucked out of productive hands and frittered away unnecessarily. Lastly, MEDC employees do not possess an uncanny ability to successfully pick winners from losers in the marketplace. The people of Michigan would be far better off eliminating the MEDC outright rather than goosing up its appropriations and responsibilities. Give the money saved by its elimination back to the people who earned it in the first place or invest it in Michigan’s infrastructure. Either way, Michigan is likely to see greater job creation than keeping the MEDC — a proven failure — alive and kicking. Michael D. LaFaive is director of the Morey Fiscal Policy Initiative at the Mackinac Center for Public Policy, a research and educational institute headquartered in Midland, Mich. Permission to reprint in whole or in part is hereby granted, provided that the author and the Center are properly cited.